﻿ Meet the New Thales 4D AESA Family Member: The Ground Master 200 Multi Mission! Meet the New Thales 4D AESA Family Member: The Ground Master 200 Multi Mission! The complexity of battlefield environments is evolving, as is the threat-scape armed forces must face during air surveillance and weapons coordination operations. Modern combat includes smaller and more agile targets, low flying threats that can quickly change speeds to evade radar detection and tracking. In this ecosystem, timeliness and quality of information are crucial, which is why Thales has developed a new radar in the 4D AESA family, the Ground Master 200 Multi Mission. The Ground Master 200 establishes tracks faster and keeps them locked for longer, thus maximising time on target. This gives units the time to evaluate the threat and take appropriate action. Because it makes full use of Thales’s digital technology capabilities, it also manages to acquire smaller and slower targets. At the core of Ground Master 200 is the technological legacy of the entire 4D AESA family products (1st note), fruit of years of user experiences in operations by over 20 armed forces. 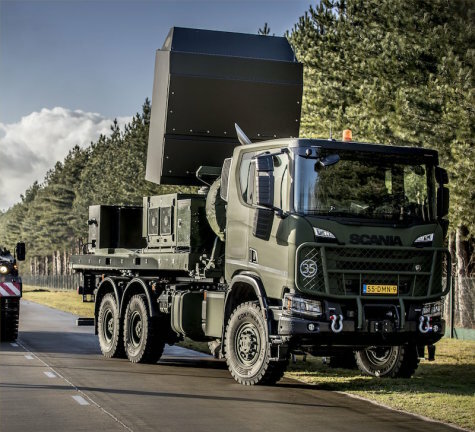 It includes Thales’s scalable and upgradable antenna architecture and software defined radar technology that offers upgrade capacity over the whole life cycle. It also features “dual-axis multi-beam”, which gives unrestricted steering flexibility in elevation and bearing. The system will be offered in two versions, an “all in one” for air surveillance and ground based air defense up to medium range, and a “compact” version scalable to specific missions like artillery Counter Battery and Weapon Locating (2nd note). Both versions are very user friendly, highly automated, and easy to transport. Both are also in advanced stage of development with first serial unit deliveries expected in 2021 (3rd note). NS100/200, Ground Master 200 Multi Mission, SM400, SMART-L MM, Sea Fire and Ground Fire. The “all in one” version, abbreviated GM200 MM/A, is mainly targeting Air Surveillance as well as Ground Based Air Defense operations up to entry level Medium Range Air Defense (MRAD). It maintains the well-known Ground Master 200 integrated C2 shelter including the radar mast to gain elevation for low level air surveillance and 2 operators on board. The “compact” version, abbreviated GM200 MM/C, is a pallet version offering higher tactical mobility and quicker deployment as required by some specific missions like artillery Counter Battery and Weapon Locating. It also suits well Air Defense missions at very short or short range (VSHORAD/SHORAD) like its brother version, the Ground Master 200 Multi Mission “all in one”. Royal Netherlands Army / Defence Materiel Organisation (DMO) have signed a first contract for nine Ground Master 200 Multi Mission “compact”, under the project ‘Counter-Rocket Artillery Mortar and Class 1-UAV detection capacity’.